Why do we need Database ? If we go back some 70 or 80 years ago or still older days every business data was processed in book or paper, which was a hectic job to maintain the data. It was very difficult to find the old data recorded in the book or paper. To get details of particular record need to search each and every single page and book , which used to take lot of time. Later as the technology improved people began to store data in file system, where the data was not in an organized format. In 1960's on wards IBM came up with a concept called Database. In simple terms Database is an organized collection of data where the data can be easily accessed, managed and updated.More over data can be secured. The data was so organized that all the related data was kept in respective tables and a relationship was established between the tables and so called Relational Database Management System (RDBMS). 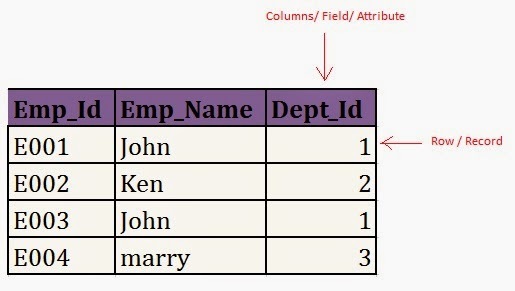 Here the data is stored in the form of table which consists of columns and rows. Columns are known as Attributes and rows are known as Records. Note : In any application there will be two things, one the front end and the other back end. Front end is java, .Net, php etc where as back end is the database i.e. Oracle,Sql Server,mysql etc. SQL is structured Query Language which is a computer language for storing, manipulating and retrieving data stored in relational database. SQL is a standard language for relational database system. All relational database management systems like MySQL, MS Access, Oracle, Sybase, SQL Server uses SQL as standard database language. DDL - Data Definition Language: As the name implies, Definition means the structure of the object. Create an object structure, alter the object structure and drop the object structure. DML - Data Manipulation Language: As the name implies, Manipulation means making changes in the table. i.e., insert a new record in the table ,update the existing record, delete the table record. DCL - Data Control Language:As the name implies, it will control the access to object. Whether user is allowed to access the object or not. DQL - Data Query Language: As the name implies, it is used to retrieve the data from the table. TCL - Transaction Control Language: As the name implies, it controls the transactions on the table data. Suppose if you have updated to any new value, and if you want the old value back then you can use this TCL commands. Rollback any DML operation performed.